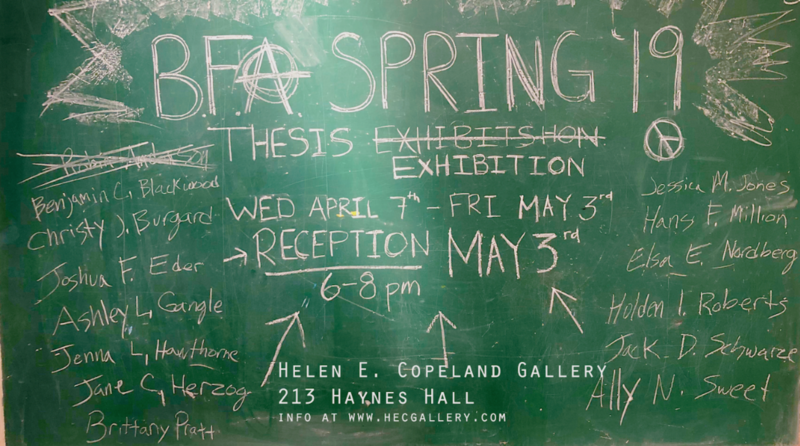 The School of Art at Montana State University is pleased to announce the opening of the 2016 Spring BFA Thesis Exhibition at the Helen E. Copeland located on the second floor of the School of Art in Haynes Hall, Bozeman MT. The show will be on exhibit Monday, April 18 to Friday, May 6, 2016. The Closing Reception is Friday, May 6, 2016 from 6:30-8:30 p.m. and will be free and open to the public. Hors d’oeuvres will be served, as will a full cash bar. The following students will be in the exhibition: Muriel Condon, Tiffany Fisher, Lane Johnson, Andy Marshall, Emily Reese, Lyle Rhodes, Haakon Samuelson, Noah Stitt, Dylan Watson, and Veronica Whiteman. From top left, going clockwise: Noah Stitt, Lyle Rhodes, Emily Reese, and Veronica Whiteman.